Jeff Moore taking the Lunch Ledge Grose Valley express. Blue Mountains. Buy print. 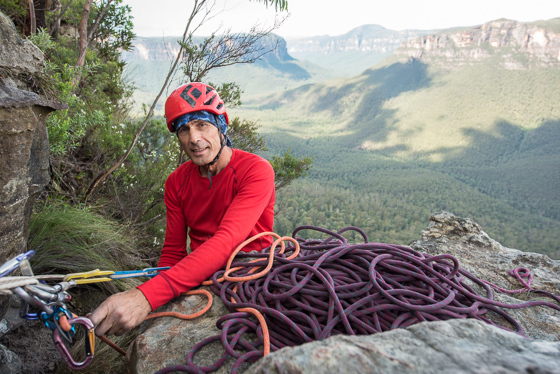 Over the last few weeks I’ve been lucky to get out a few times with mates and climb some of the Blue Mountains moderate multi-pitch classics. 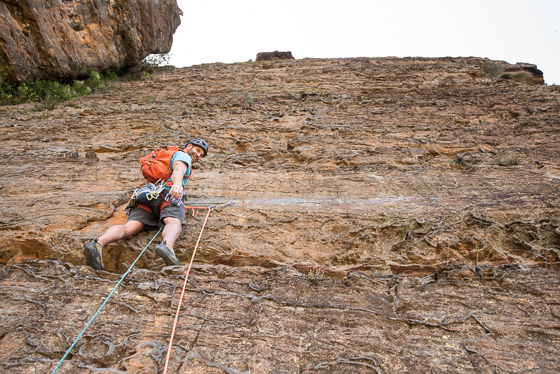 How good is Bunny Bucket Buttress (270 meters, grade 18) and Bellbird Wall (104 meters, grade 18)!? 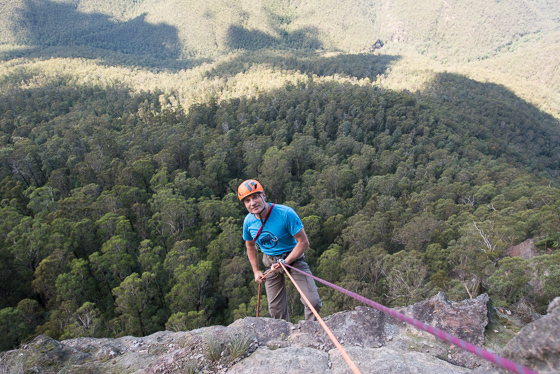 It is perhaps eight years since I’d done Bunny Bucket Buttress and incredibly I’d never done Bellbird Wall before. Such fun outings! 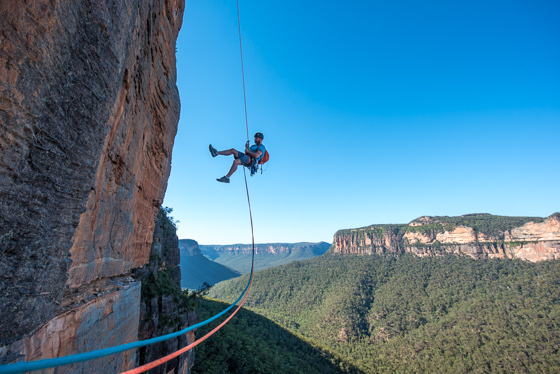 They were great reminders of what makes the Blue Mountains such an awesome, interesting and varied place to climb (and live). Now I don’t normally lug my professional model Nikon and it’s big fat wide angle lens along for the ride on these long outings, preferring to move fast and light, but this time I did. There were are couple of thoughts behind this. I saw it as part of the challenge; trying to get a couple of shots along the way without slowing down the show too much. As far as climbing media is concerned, it gets boring when all you see are photos of the same six climbers on the hardest of routes; in contrast, for example, I’m proud that my book Rock Climbing Down Under features over 200 different climbers — on all sorts of rock all over the country. Photographically, I generally strive for perfect compositions and working from abseil is my norm, but more spontaneous shots also have their place, also, some of the shots here, well, you just couldn’t get them without also actually climbing the routes as well. Incidentally, I scoped out some angles for future shoots too! Did I say how much fun it was to get out? Anyway, enjoy my brief little photo essay on these two wonderful routes. It’s great to see MountainFilm return to tour Australia and New Zealand again this year. 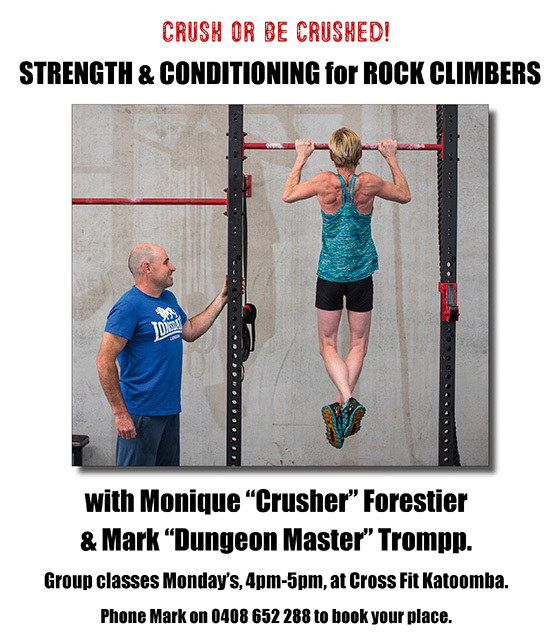 I’m pleased to be a sponsor of this event and I watched the show in the Blue Mountains the previous weekend. Totally inspiring and entertaining set of films! The tour is largely over but Perth, Woolongong, Adelaide, Port Maquarie and Ipswich remain; info and book tickets here. We have a new distributor in the USA for our Best of the Red guidebook. Yay! This is a great guidebook covering all of the best sport climbing areas of the Red River Gorge in Kentucky — one of my favorite climbing areas in the world. We also have a new website for the book where you can order the book direct if you’re in the USA, go to www.bestofthered.com, the book is only $30. And our author, Brendan Leader, has done an awesome job growing the Red Rover Gorge climbing community on social media, be sure to follow @bestofthered on Instagram. I’ve purchased 100 beautifully made U-bolts which I’m donating to rebolting efforts in the Blue Mountains. So if you have a rebolting project in mind (not new routes) then please contact me directly and I’ll hook you up. Enjoy Easter. Be safe and happy climbing! 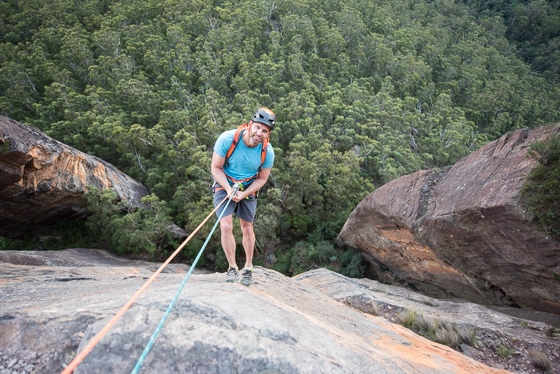 Jeff Moore on the second abseil of the Grose Valley Express…. 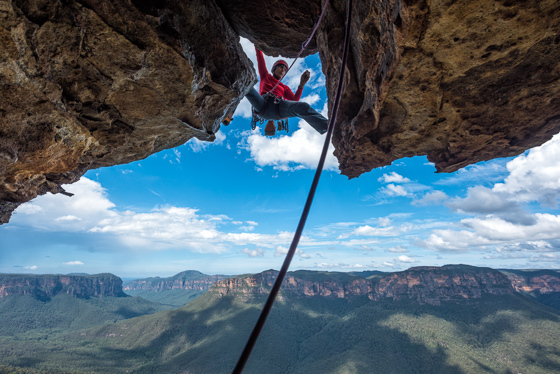 Jeff following the fantastic sixth pitch of the eight pitch (270 meter) uber-classic Bunny Bucket Buttress (18), at Pierces Pass in the Grose Valley, Blue Mountains. Jeff starting up an incredible 40-meter pitch of sustained jug hauling, pitch seven (18) of Bunny Bucket Buttress. 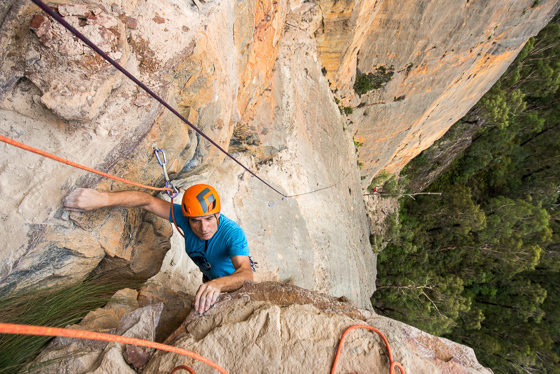 Back into the Grose again… this time it’s Terry Tremble rapping in for the three pitch Bellbird Wall (pitches are 16, 18 and 15) at Pulpit Rock. 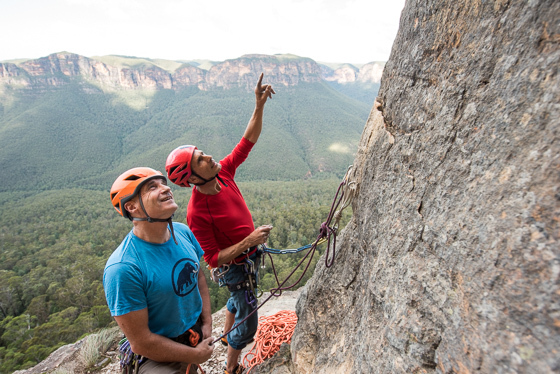 “Simon get your hand off the camera and onto the rope thank you!” Terry topping pitch one (40m, grade 16) of Bellbird Wall. 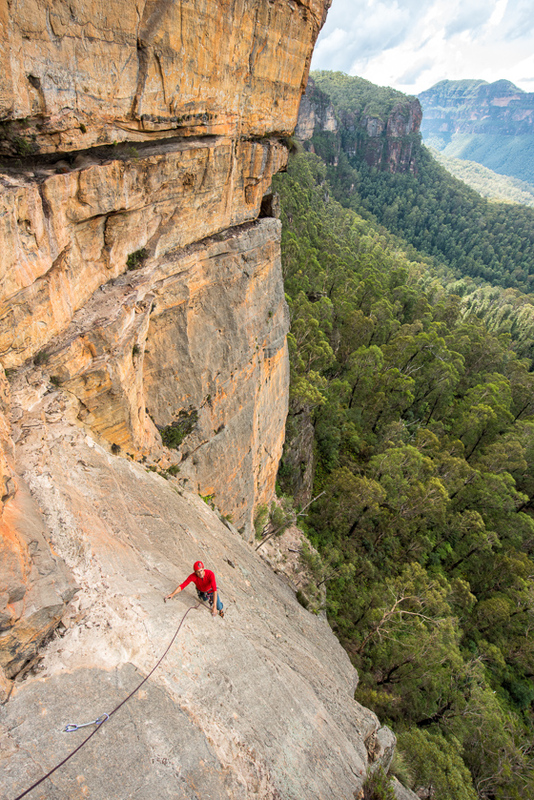 Marty Beare, following pitch one of Bellbird Wall. Buy print. Getting ready for pitch two (18) of Bellbird Wall. Terry has been around long enough to know when he’s being sand-bagged. “You’ll be fine, the crux holds don’t look too wet at all..” says Marty. “Um, yeah sure, they look dripping wet to me!” says Terry. (The holds were soaked). 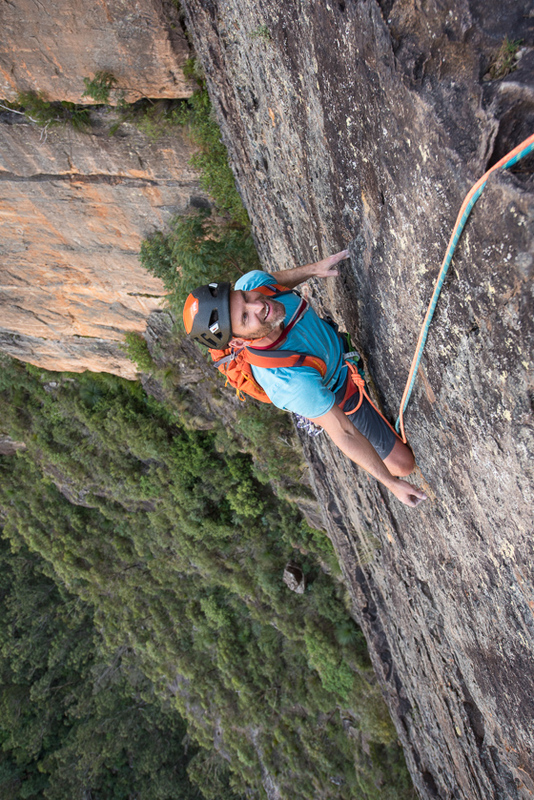 Marty leading the short but awesome third pitch (15) of Bellbird Wall. Buy print. Marty, in his element, atop Bellbird Wall. 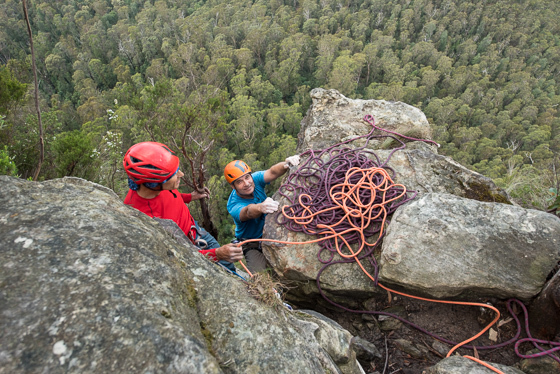 Summit jugs for Terry topping out on Bellbird Wall. Good times. 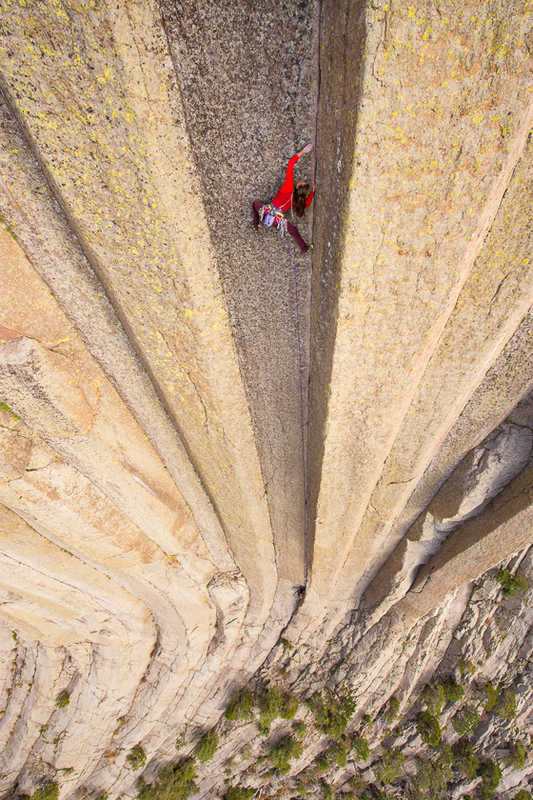 Brittany Griffith climbing Mr Clean (5.11a), one of the immaculate lines on Devils Tower, Wyoming, USA. Buy print.